Recently there has been bit of buzz about a study claiming that female named hurricanes cause more fatalities, on average, than male ones. The authors suggested that the discrepancy is attributable to gender bias. Female named hurricanes do not seem as threatening to people, so presumably they take fewer precautions. From the start this seemed pretty far-fetched, and in fact a number of problems have been found with the study. But it got me thinking about hurricane names. A more likely effect of a hurricane’s name would be to discourage parents from giving their children that name, if the hurricane is associated with death and destruction. Fortunately, there is readily available data with which to test this hypothesis. For hurricanes, I used the same data as the hurricane gender study described above (they may have had some problems with their methodology, but at least they released their data). It contains data on 92 Atlantic hurricanes that made landfall in the U.S. since 1950*. For baby names I turned to the Social Security Administration. There is a great R package called babynames that makes the yearly SSA data available in a readily accessible format for use in R. As an aside, the SSA baby names data is the source of all sorts of interesting visualizations and analyses, such as the baby name voyager and this article from fivethirtyeight.com on predicting a person’s age based on their name. The tricky part of this analysis is deciding how to define a decrease in name usage after a hurricane. The simplest way would be to look at how many times a name was given in the year of a hurricane versus how many times that name was given the following year. For example, how many baby Kartrinas were there in 2005 versus 2006. However, this method does not take into account that most names are either decreasing or increasing in popularity as part of a longer-term trend. So you have to look at how the popularity of a name was changing before the hurricane as well. To see why, look at this plot of the number of babies named Katrina over time. Katrina peeked in popularity in in 1980 and has been declining ever since. But from 2004-2005 the number of Katrina’s actually increased about 13%. From 2005-2006, however, it decreased dramatically – by 26%. It’s a pretty good bet that this rapid decrease was due to the hurricane. To quantify the change in a name’s usage after a hurricane, I made the assumption that the best predictor of how a name’s popularity will change in a given year is how it changed last year. To calculate the post-hurricane change in name usage I subtracted the percent change in name usage in the year before the hurricane from the percent change after the hurricane. In the Katrina example the post hurricane change would be (-26%) – (13%) = -39%. This post-hurricane percent change value is what I use in the analysis below. Hurricane Carla was an extremely intense storm that hit Texan in 1961, killing 43. The name “Carla” had been surging in popularity, but after 1961 it started a decline in popularity from which it never recovered. It seems a pretty good bet that the hurricane had a major role in Carla’s decline. Interestingly, the first live television broadcast of a hurricane was of Carla, with a young Dan Rather himself reporting from Galveston. Could the shock of the American TV-viewing public seeing footage of the storm in their living rooms have contributed to the demise of Carla as a name? Back to the analysis. Indeed, the hurricane baby name effect seems real. After running the numbers, I found that names associated with a landfalling hurricane were about 15 percent less common in the year after the hurricane. 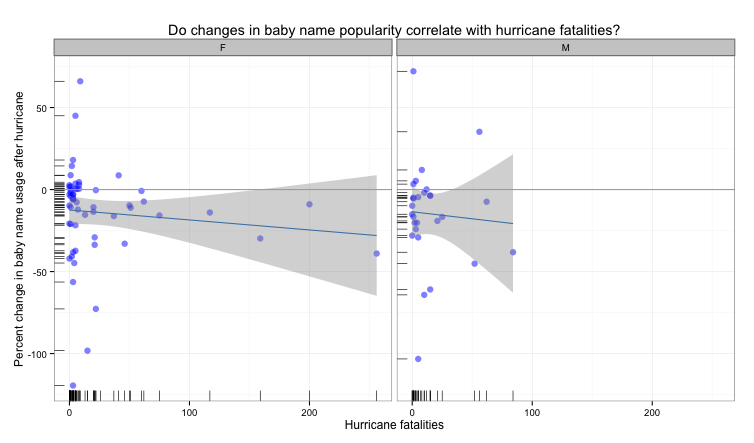 Out of the 93 hurricanes in the data set, 65 were associated with a decrease in the popularity of their names, and only 21 were followed by increasing name usage. (Seven hurricane names were not found in the SSA data in their landfall year). So far this is pretty intuitive. 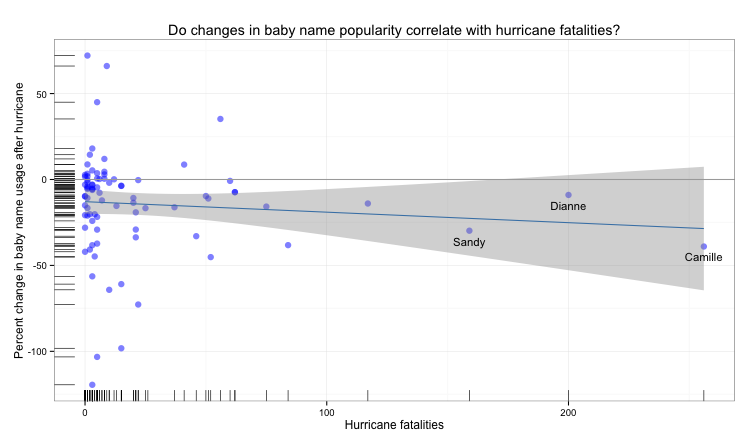 Of course people are less likely to name their dear infant after a natural disaster. 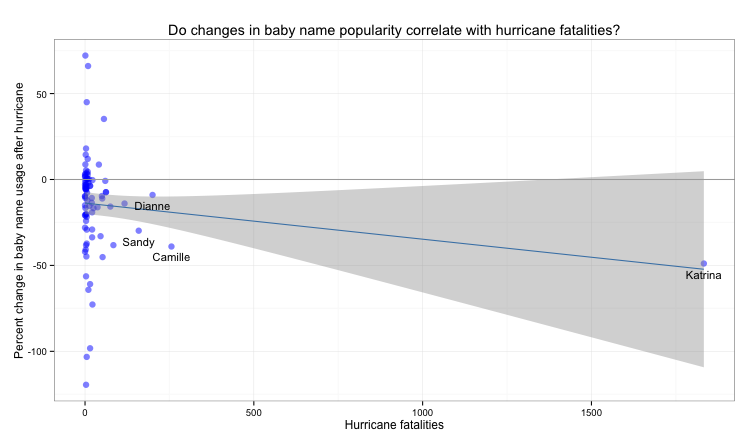 Based on this reasoning, you’d expect that the more fatalities caused by a hurricane, the greater the baby name effect. Let’s test that. By the way, there are more female names because from 1950 – 1979 all Atlantic hurricanes were given female names. There’s an almost endless amount of interesting things to glean from the baby names data. My ultimate dream is an algorithm to determine the perfect name for your baby based on a number of criteria chosen by the expectant parents. It would really take the stress out of the naming process. One of the criteria would certainly be that the name is not on the World Meteorological Association’s list of tropical storm names! Data and code available on github. * The authors of the hurricane fatalities study did not include Katrina in their data set. I added it in with data from Wikipedia.